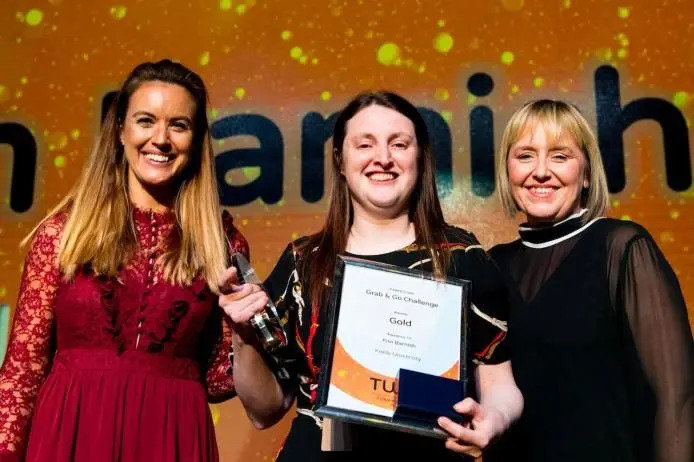 Keele University won medals in three categories at the annual The University Caterers Organisation (TUCO) Competitions held at Warwick University on 26th and 27th March 2019. The first win for Keele University was a Bronze Medal for Pastry Chef James Jefferies’ impressive cakes served in the Afternoon Tea Challenge at the Salon Culinaire. Creating four sweet items for an afternoon tea menu. James ‘choices were Bitter Chocolate & Peanut Brownie, Lemon Meringue Pot, Tonka Bean Choux Bun and Ginger, Apricot & Sultana Flapjack. Sous Chef Kim Barnish, brought home the first Gold Medal for the eventing in the Grab ‘n’ Go Challenge where competitors were asked to produce a savoury hand-held snack and a dessert which must be allergen free. For the savoury snack, Kim chose a rolled flatbread filled and baked with mildly spiced coronation style chicken and for the dessert she created a typical Sicilian cannolo without any dairy products and utilising gluten free flour. At the awards dinner the pressure was on as Kim had won a similar event at last year’s competition. Always ready to deliver, Kim rose to the top of the leader board winning a Gold medal for Keele. It was then the turn of the Cook and Serve Team Adrian Ascina, James Tudor & James Eardley to bring the second win of the evening. Creating a menu from pre selected ingredients, this was cooked and served for a table of four guests. Adrian, who has only competed once before this event, was asked to serve a pre-dinner drink which was Bombay Sapphire Gin with Spiced Tonic Water flavoured with Kaffir Lime Leaf. His precise and attentive front of house skills ensured the team outshone all others and he was awarded with Best Service on the day.